Migrations are mainly for keeping the data model of you database up-to-date, but a database is more than just a data model. Most notably, it’s also a large collection of data. So any discussion of database migrations wouldn’t be complete without also talking about data migrations. Updated Feb 12, 2015: Changed the data migration to lookup a model from the app registry. When you would like to load “system data” that your application depends upon being present to operate successfully. When a change to a data model forces the need to change the existing data. Do note that loading dummy data for testing is not in the above list. You could use migrations to do that, but migrations are often run on production servers, so you probably don’t want to be creating a bunch of dummy test data on your production server. We start off by defining the function load_data which - you guessed it - loads data. For a real app we might want to go out to blockchain.info and grab the complete list of historic prices, but we just put a couple in there to show how the migration works. When running migrations, it’s important to get the version of our PriceHistory model that corresponds with the point in the migration where you are at. As you run migrations, your model (PriceHistory) can change, if for example you add or remove a column in a subsequent migration. This can cause your data migration to fail, unless you use the above line to get the correct version of the model. For more on this, please see the comment here. This is arguably more work than running syncdb and having it load a fixture. In fact, migrations don’t respect fixtures - meaning they won’t automatically load them for you like syncdb would. This is mainly due to philosophy. While you could use migrations to load data, they are mainly about migrating data and/or data models. We’ve shown an example of loading system data, mainly because it’s a simple explanation of how you would set up a data migration, but often times, data migrations are used for more complex actions like transforming your data to match the new data model. An example might be if we decided to start storing prices from multiple exchanges instead of just one, so we could add fields like price_gox, price_btc, etc, then we could use a migration to move all data from the price column to the price_btc column. This will load data from the fixture into the database. This doesn’t happen automatically as with a data migration (which is probably a good thing), but the functionality is still there; it hasn’t been lost, so feel free to continue to use fixtures if you have a need. The difference is that now you load data with fixtures when you need it. This is something to keep in mind if you are using fixtures to load test data for your unit tests. This, along with the previous two articles, covers the most common scenarios you’ll encounter when using migrations. There are plenty more scenarios, and if you’re curious and really want to dive into migrations, the best place to go (other than the code itself) is the official docs. It’s the most up-to-date and does a pretty good job of explaining how things work. If there is a more complex scenario that you would like to see an example of, please let us know by commenting below. Schema Migrations: A change to the structure of the database or tables with no change to the data. 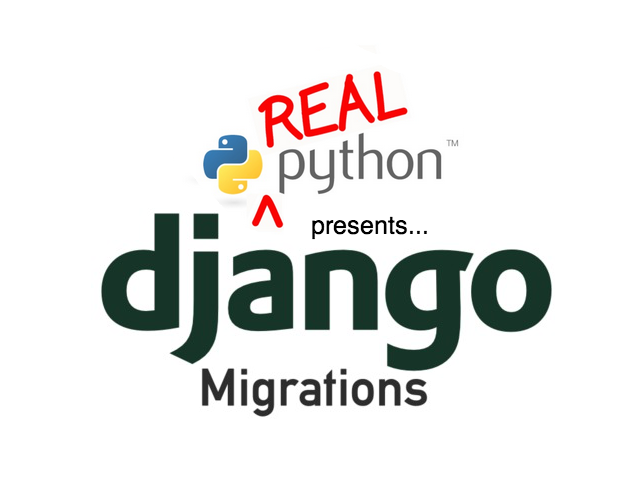 This is the most common type, and Django can generally create these migrations for you automatically. Data Migrations: A change to the data, or loading new data. Django cannot generate these for you. They must be created manually using the RunPython migration. So pick the migration that is correct for you, run makemigrations and then just be sure to update your migration files every time you update your model—and that’s more or less it. That will allow you to keep your migrations stored with your code in git and ensure that you can update your database structure without having to lose data.